A new transfer facility will give Dublin Airport the capacity to quadruple its connecting passenger business, it has announced. The €16 million transfer facility has opened close to Terminal 2, and will cater specifically for passengers connecting between flights. The three-story hub includes airline information desks, boarding card checkpoints, and immigration and customs facilities, allowing transfer passengers to complete “a one-stop flight connection process” within Pier 4. Designed to allow natural light flow through the building, the new transfer facility will soon feature an art installation inspired by the song 40 Shades of Green, which was written by Johnny Cash while on a trip to Ireland. 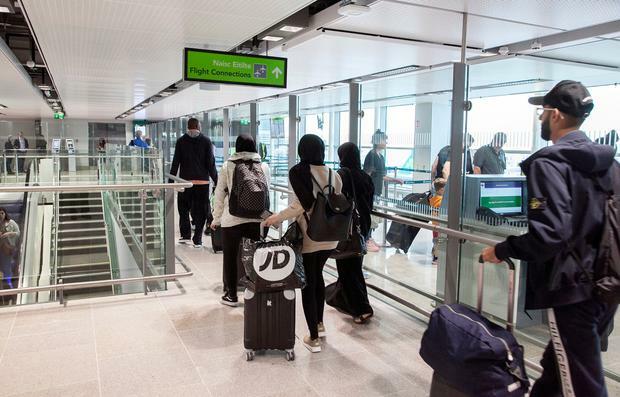 Aided by its US preclearance services and “gateway” location between Europe and North America, Dublin Airport’s connecting passenger business has grown from 550,000 in 2013 to almost 1.6 million last year, it says. This year, numbers have increased by a further 17pc. The growth comes as transatlantic business booms in particular – with Aer Lingus’s mushrooming route network and new services from the likes of Norwegian and Air Canada contributing to an extra 391,000 transatlantic seats in 2018 alone. “We have been growing Dublin Airport as a connecting gateway between Europe and North America steadily over the past five years and this new transfer facility will help us to further expand that business,” said the airport’s MD, Vincent Harrison. The new transfer facility was delivered by Flynn Management & Contractors as part of Dublin Airport’s €100 million plus investment programme this year. The airport has been enhancing its facilities, opening the €22m South Gates, completing road realignments for a second runway and starting a revamp of the airside retail area in Terminal 2, though Aer Lingus recently called for “significant infrastructure development and process improvement” to facilitate further growth. Construction of the €320m “North Runway” is expected to start next January.